Older people often suffer from heat-related illnesses because they sweat less and don’t feel as thirsty as they used to. 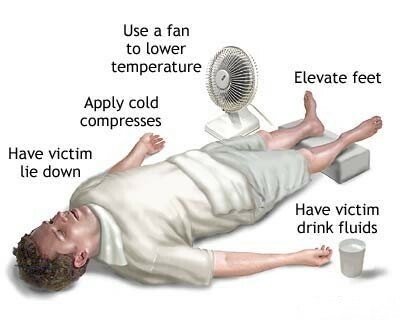 If you’re exposed to hot temperatures for a long time, haven’t been drinking enough fluids, or suffer a breakdown in your body’s temperature mechanism, you may find yourself with heat exhaustion or heatstroke. Diabetes or heart disease increases your risk. If you don’t get immediate medical attention, your body will shut down completely. About half the elderly who suffer from this serious problem will die without treatment. If you experience any symptoms of excessive heat, stop what you’re doing, get something to drink, find shade, and ask for help. Cool rapidly. A heatstroke victim will be extremely hot but not sweating. You should move him to a cool place; wrap him in wet sheets, if necessary; and get him to a hospital immediately. Drink liquids. If the person feels faint but is sweating, that’s a sign of heat exhaustion. Try giv­ing him some fluids, such as water or juice, and then take him to a medical center. Avoid self-medicating. Don’t take salt pills to try to replace your lost sodium. Leave it to medical personnel to determine what you need to restore your body’s chemical balance. Heavy sweating, vomiting, or diarrhea can lead to dehydration if you don’t replace the fluids you lose. These conditions are especially dangerous because they flush away your body’s much-needed supply of salt. And, of course, dehydration can lead to even more serious problems like heatstroke, heat exhaustion, or hypother­mia (loss of body heat). These conditions are easy to avoid by taking the proper precautions. Lighten up on clothing. Wear light, loose-fitting styles when you’re out in hot weather. Make sure your body is not constricted. Tight-fitting clothes make it harder for your sweat to evaporate, and sweating is your body’s most effective way to cool down. Lighter colors also feel cooler since they don’t absorb the heat as much as dark colors. Fan that breeze. Keep yourself cool whenever pos­sible. If you do get overheated, sit in front of a fan, air conditioner, or even a window and enjoy a cool breeze. Beware of hot tubs. You may love to relax away your cares in a hot tub or sauna, but these set­tings pose a health risk if you’re not careful. Heat-associated deaths have been linked to saunas, hot tubs, and whirlpool baths. Limit your time, and get out immediately if you feel lightheaded or ill in any way. Drink, drink, drink! Don’t wait until you’re thirsty to have some water. Keep a water bottle handy and sip it throughout the day. Your thirst mecha­nism often doesn’t kick in until you’re already low on fluids. Drink extra water if you tend to sweat heavily. How to Access Blocked Sites?